Gilbane delivers new standard of school building through the repositioning of a vacant office complex. BASIS Independent Schools is a growing national network of schools serving Pre-K through 12th grade. Working with Perkins Eastman, the Gilbane Building Company team delivered a new BASIS Independent campus in McLean, Virginia. Through a change in occupancy of a former corporate headquarters campus, BASIS Independent Schools is developing an environment uniquely suited to its STEM-focused, liberal arts program. The team took a drab and uninviting vacant office building and transformed it into a versatile educational space for students. It took the ingenuity of the design-build team to find innovative ways to turn spaces like the lobby into a gathering space instead of a means of entry, and conference rooms and cubicles into classrooms and recreational spaces fit for BASIS Independent’s challenging curriculum. Classrooms, labs, athletic, and administrative space are all organized around a central atrium that will become the heart and crossroads of the school. In addition to serving as the school’s dining room, the atrium will be the primary gathering and social activity space. In total, the site is a 220,000 SF, three-story commercial property. The initial phase was 110,000 SF and accommodates about 650 students. The second phase is slated to include a full-sized gymnasium and additional classroom space for the upper school with the goal of total enrollment at about 1,250 students. The program was arranged around three sides of the atrium. Academic classrooms and science labs are located on the second and third floors of the east side. 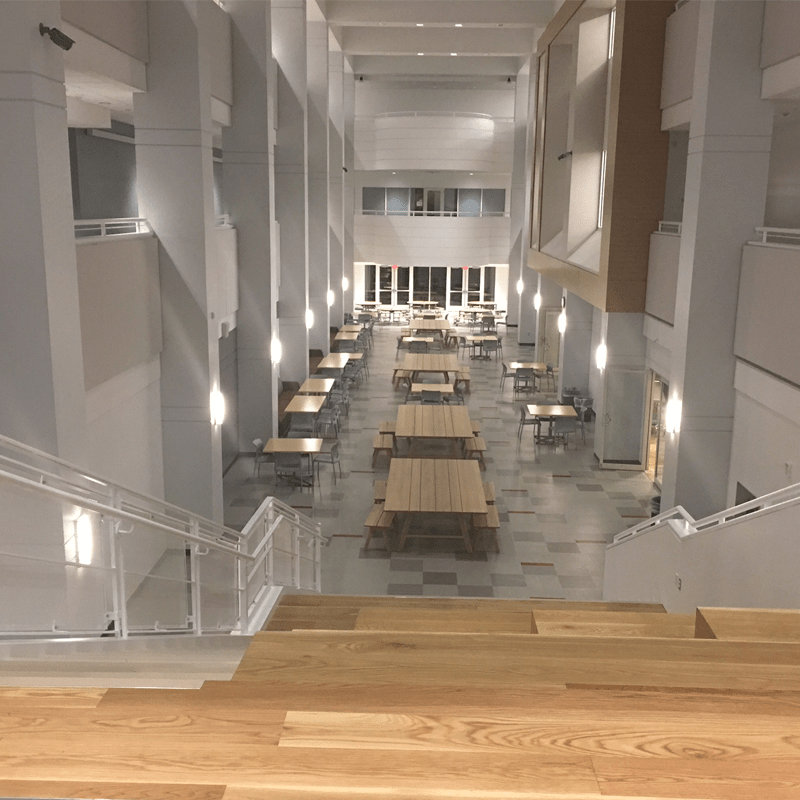 Elective programs, active collaboration spaces and faculty offices are located on the north side, and on the west side a large, two-story multipurpose space have been inserted on the second floor. Other community spaces, like the reading room and auditorium, performing and visual arts, as well as the administrative core, are also on the west side. The early childhood programs are located on the first floor. The program also included the reuse of an existing 200-seat auditorium, reconfigured slightly for stage performances. This design is also exploring the evolution of the BASIS branded environment – through the use of color, materials, furniture, lighting, and graphics – to create a distinctive and exciting learning ambiance. Repositioning has become a cost effective and time saving solution for schools that are looking to find space for growing enrollments. However, it comes with the challenge of making an office complex kid friendly. With the lack of outdoor space in an urban setting, creative solutions needed to be developed to make room for traditional play spaces. At BASIS Independent McLean, exterior improvements included a playground and soft play area at the rear of the building for the preschool and kindergarten program and a large outdoor space atop the parking deck to accommodate the middle and high school students. The large outdoor space included two playground structures, artificial turf fields, and recreational courts. A future exterior improvement phase will include additional fields at the location of existing parking lots on the west side of the campus. For this unique project, the developer purchased an existing office building and converted it to a private school for BASIS Independent. Our ability to build in a diverse range of markets throughout the county was an important factor in the client’s decision. 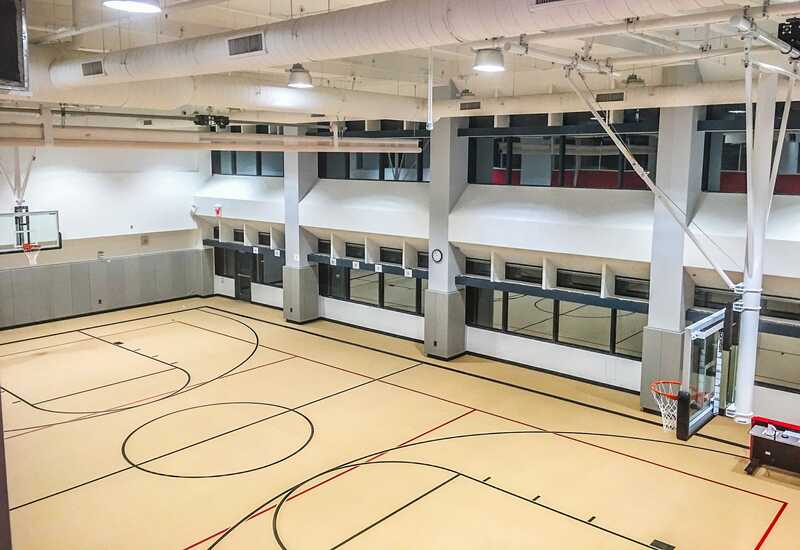 Phase II included up to an additional 100,000 SF of class room space as well as outdoor recreation space.